Our Lady of Pontmain, also known as Our Lady of Hope, is the title given to the Virgin Mary on her apparition at Pontmain, France on 17 January 1871. These apparitions were approved by Pope Pius IX. The Franco-Prussian War (War of 1870) was the culmination of years of tension between the two nations, which finally came to a head on 19 July 1870, when Emperor Napoleon III of the second Empire declared war against Prussia. From the first days of the war, defeat followed defeat. By January 1871, Paris was under siege, two-thirds of the country was in the power of the Prussians, and they were advancing. The apparition is said to have occurred at the height of the Franco-Prussian War. Pontmain, a hamlet of about 500 inhabitants, lay between the oncoming Prussian army and the city of Laval. The Barbedette family consisted of father César, his wife, Victoire, with their two sons Joseph and Eugène, aged ten and twelve, and another older boy who was away in the army. On the evening of 17 January 1871, the two boys were helping their father in the barn when the elder, Eugène, walked over towards the door to look out. As he gazed at the star studded sky he suddenly he saw an apparition of a beautiful woman smiling at him; she was wearing a blue gown covered with golden stars, and a black veil under a golden crown. His father, brother, and a neighbour came out to look and Joseph immediately said he too could see the apparition although the adults saw nothing. The mother, Victoire, came out but she too could see nothing. The boys’ parents could not see what their children were seeing that night and called for Sister Vitaline, the local school teacher. She, like the boys’ parents, could also not see the apparition, and called for two girls, Françoise Richer and Jeanne-Marie Lebosse, aged nine and eleven. Sister Vitaline suggested that perhaps Our Lady was visible only to the children. Without any knowledge of the apparition, these two girls looked into the night sky and began describing Our Lady in the same exact detail as the Barbedette boys had described. A crowd gathered to pray as word quickly spread among the anxious villagers. Children saw the beautiful Lady, and gleefully pointed up to her. Adults, however, only saw three stars forming a triangle. As they prayed the Rosary, the children saw the garment's stars multiply until it was almost entirely gold. Next, the children saw a banner unfurl beneath the Lady. Slowly, a message appeared: But pray, my children. God will hear you in time. My Son allows Himself to be touched. Upon hearing the message read aloud, the crowd spontaneously began the hymn "Mother of Hope". As they sang, Our Lady laughed and joined in the singing. The children squealed with delight as her hands kept time with the music. When the crowd began "My Sweet Jesus," her expression changed to profound sadness and a red crucifix appeared in her hands, with the words "Jesus Christ" above it. Her eyes mournfully contemplated the cross during the hymn. As the people sang the "Ave Maris Stella," the cross vanished and her smile returned, though with a touch of melancholy. Two small white crosses then appeared on her shoulders before Our Lady disappeared behind a cloud. As the night prayers came to a close, the apparition ended. It was about nine o'clock. The Apparition had lasted about three hours. She was young and tall of stature, clad in a garment of deep blue, ... Her dress was covered with brilliant gold stars. The sleeves were ample and long. She wore slippers of the same blue as the dress, ornamented with gold bows. On the head was a black veil half covering the forehead, concealing the hair and ears, and falling over the shoulders. Above this was a crown resembling a diadem, higher in front than elsewhere, and widening out at the sides. A red line encircled the crown at the middle. Her hands were small and extended toward us as in the 'miraculous medal.' Her face had the most exquisite delicacy and a smile of ineffable sweetness. The eyes, of unutterable tenderness, were fixed on us. Like a true mother, she seemed happier in looking at us than we in contemplating. That same evening the Prussian forces inexplicably abandoned their advance. General von Schmidt of the Prussian Army who was about to move on the city of Laval towards Pontmain, received orders from his Commander not to take the city. On the evening of 17 January 1871, the Commander of the Prussian forces, having taken up his quarters at the archiepiscopal palace of Le Mans, told Msgr. Fillion, Bishop of that diocese: "By this time my troops are at Laval". On the same evening, the Prussian troops in sight of Laval stopped at half-past five o'clock, about the time when the Apparition first appeared above Pontmain, a few miles off. General Schmidt is reported to have said on the morning of the 18th: "We cannot go farther. Yonder, in the direction of Brittany, there is an invisible 'Madonna' barring the way." The sudden stopping of the Prussian forces in sight of Laval, and their retirement the following morning, meant, together with the saving of Brittany, the turning back of the tide of conquering soldiery from that part of France. The war was practically at an end. On 23 January 1871, the long-hoped for Armistice was signed. Soon all the thirty-eight conscripted men and boys returned home unscathed. After that the devotion to the Blessed Virgin under the title of that of Notre Dame d'Esperance de Pontmain, Our Lady of Hope of Pontmain, was authorized by the ecclesiastical authorities, and the confraternity of that name has been extended all over the world. After the apparition of Our Lady of Hope on 17 January 1871, pilgrims made up of both the clergy and the laity came to Pontmain. At the same time, inquiries and investigations were made about the apparition; the visionary children were submitted to various intense interrogations. Finally, on the Feast of the Purification, 2 February 1872, Msgr. Wicart, Bishop of Laval, issued a pastoral letter giving a canonical judgment on the apparition. Thus, the veneration of Our Lady of Hope of Pontmain was given official Church recognition and approval. Joseph Barbadette became a priest of the Congregation of the Oblates of Mary Immaculate; his brother Eùgene became a secular priest. He was assisted by one of the girls who had seen Mary as his housekeeper, and the other, Jeanne-Marie Lebossé, became a nun. In May 1872, Bishop Wicart authorized the construction of a sanctuary, which was consecrated in October 1900. In 1905 Pope Pius X elevated the Sanctuary to the status of a basilica. 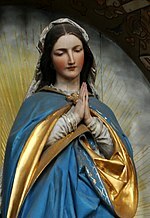 Pope Pius XI gave a final decision regarding the mass and office in honor of Our Lady of Hope of Pontmain. A final papal honor was given to Our Lady of Hope on 16 July 1932 by Cardinal Pacelli, who later became Pope Pius XII, by passing a decree from the Chapter of St. Peter's Basilica that the statue of the Blessed Lady, Mother of Hope, be solemnly honored with the crown of gold. The Lady then was crowned in the presence of archbishop, bishops, priests and the laity by Cardinal Verdier, Archbishop of Paris. The coronation took place on 24 July 1934. At Pontmain, it was a matter of a message of prayer, very simple in the dramatic circumstances of war and invasion. At Pontmain, Mary is a sign of hope in the midst of war. A place of pilgrimage, it attracts annually around 200,000 drawn from among the people of the region, with some international pilgrimages, especially from Germany. Wikimedia Commons has media related to Our Lady of Pontmain. This page was last edited on 6 January 2019, at 04:21 (UTC).